Now today’s General Hospital eppy is more like it! Have I told you lately how much I LOVE Carolyn Hennesy as Diane? Hennesy is so uber-talented that she delivers 110 percent ev-e-ry sin-gle time she enters a scene. And paired with Derk Cheetwood as Max Giambetti…..well they make me smile or outright laugh out loud together. When Diane sang “Signed Sealed and Delivered” during Karaoke night at Jakes. Watch the video. It says it all! One other bit of good news as far as I’m concerned. The apparent pairing of Alexis Davis (Nancy Lee Grahn) and Mac Scorpio (John J. York). One of my pet peeves on GH has been the lack of screen time for the handsome Port Chuck police commish. York is SO talented and disgustingly underused. The only time he gets screen time is when he’s used to prop the Mob storyline. We need more Mac and he needs a good solid storyline….and I think there’s real possibilities with Alexis. And as far as Alexis…..when her tween-age daughter (Molly) is telling whoever will listen about the blatantly bad choices in men her mother has made in the past…I think that signals a serious lack of judgement. Actually, that’s the biggest understatement of the year…..Let’s review her past relationships. Sonny – mob boss; Rick – pathological liar and sociopath; Jerry – psychopath. And that’s a sad state of affairs considering Alexis, in her professional life, is a smart, saavy, shark of an attorney in the courtroom. But in her private life……not so much. Grahn was soooo funny! Like Hennesy, Grahn is another one who puts a smile on my face, when she’s allowed to have some lighter, more comedic moments. And when she’s paired with Hennesy….the skys the limit in terms of talent with those two. In my opinion, Max/Diane and Alexis/Mac are more of what we need on GH. And let’s have less of the Mob Wars and the Lucky/Liz/Nik triangle. Because Let’s face it. Neither one of those storylines can end well. For so long, I have waited for lovable mob bodyguard Max Giambetti (Derk Cheetwood) to get more airtime on General Hospital. Max is honest, loyal and a real gentleman. My kind of guy! Cheetwood really brings out the human, endearing side of Max. 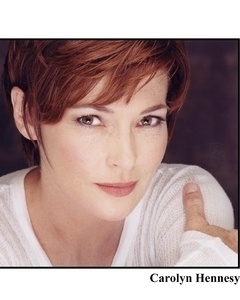 And with the romantic pairing of super lawyer Diane Miller (Carolyn Hennesy), we’re finally seeing more of Max. The scenes with Cheetwood and Hennesy are one of the few bright spots of the show right now. Those two are so much fun to watch. Just yesterday, Max defended Diane’s honor to Russian mobster Andre Karpov. I also like watching Max’s brother and fellow mob bodyguard, Milo Giambetti, played by Derk’s real-life brother, Drew Cheetwood. Unfortunately, Milo has gotten even less airtime than his brother. But things are looking up for fans of the Giambetti/Cheetwood brothers. EW.com is reporting that Vincent Pastore of Sopranos fame has been hired to play Maximus Giambetti, father to Max and Milo. Maximus, a big-time mob boss, has gotten the impression from Max that he is the crime boss of Port Charles – not just a bodyguard. I got this happy tidbit of news from the Derk Cheetwood Message Board, which also provided the Max and Diane photo. If you haven’t visited the board, it’s a must. It’s a happy place to post. Another fun message board is the Carolyn Hennesy Message Board. Lots of fun happenings there – and everyone is so nice! And tell them Soapbox sent you! Diane, Max, Alexis, Jerry = Hysterical! Did you catch those scenes Wednesday on General Hospital with Diane/Max and Alexis/Jerry at the Metro Court? I tell you, anytime Diane and Alexis are together lately, they never fail to make me laugh. It happens before I even realize it. I’m sitting there watching their scenes and I hear myself laughing. You see, Alexis has been trying to dissuade Diane from dating Max Giambatti, the mob bodyguard with a heart of gold. I just love Derk Cheetwood as Max. Always have. And when he is paired with Hennesy, the two are just hysterical. Meanwhile, Alexis is incredibly attracted to Jerry (Sebastian Roche)…..You know, the one who masterminded and terrorized the hostages in the Metro Court crisis under the identity of Mr. Craig. After Diane breaks up the kiss between Alexis and Jerry – a few minutes later Diane and Max are smooching at a nearby table…..So Alexis marches over to Diane and tells her that she’s making a spectacle of herself. And from there, the two get into a spirited discussion of who is with the baddest bad boy. Diane launches into a diatribe about how she and Max were discussing baseball – to which Alexis retorts that Diane’s mind has turned to mush. Never to be outdone, Diane lashed out with perhaps the best line of the day. Here’s the video. Check it out for yourself.